One of my favorite things in the whole world is making after school snack time extra fun for my kids. I feel like it’s in those first few minutes when my kids walk in the door after school that they are open and excited to talk to me about their day. Everything is fresh on their mind and before the unpleasantness of homework begins, I love to sit with them and surround myself in their cuteness while enjoying an after school snack. After school can be a busy time with homework, making dinner, after school activities and sports, so having both quick and easy and high-quality snacks are a must for my family. 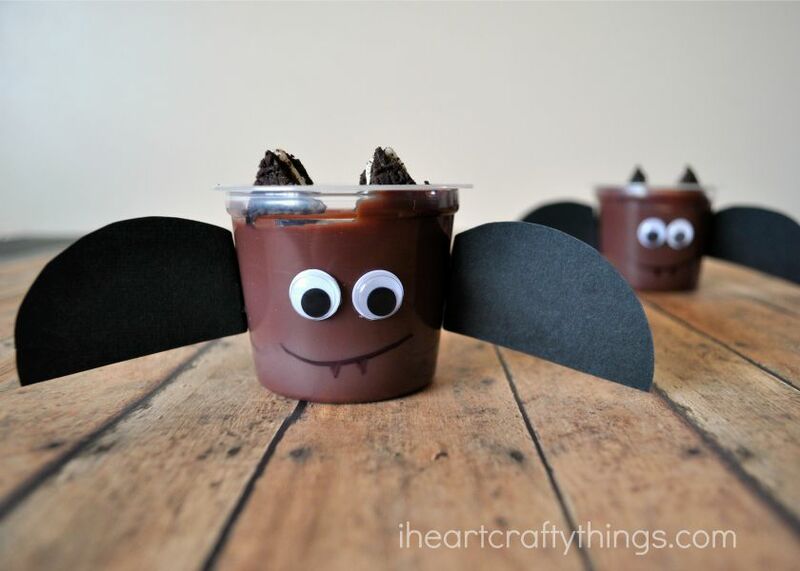 One of my favorite ways to make snack time fun for my kids is by taking ready made snacks, like Hershey’s Ready to Eat Pudding, and spending just a few minutes to add a bit of flare to the containers. 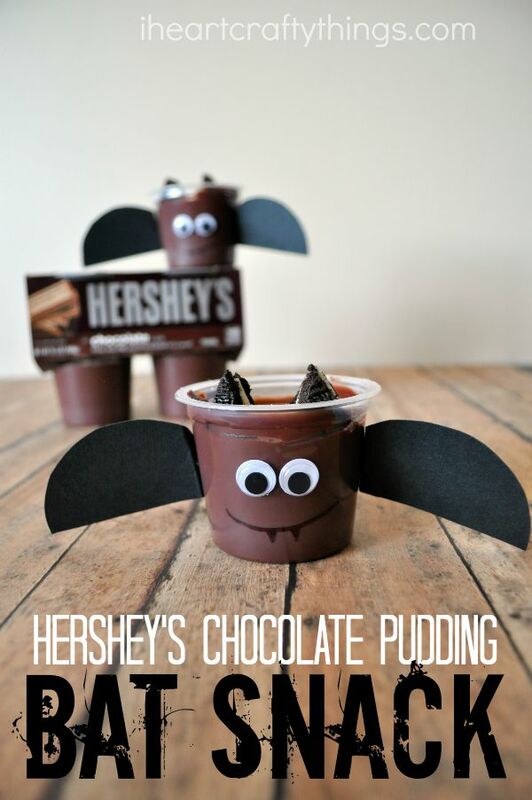 Hershey’s Ready to Eat pudding is rich, creamy and is made with real Hershey’s cocoa so it’s a favorite at our house. 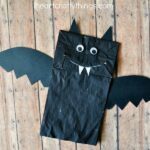 I picked some up at Walmart last week while I was grocery shopping and I surprised my kids with this fun Halloween Bat Snack. It was a big hit! 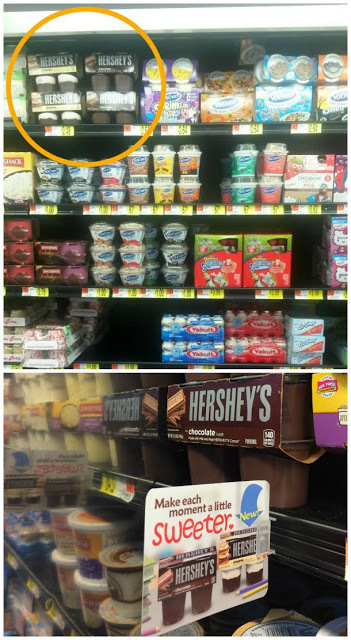 You can find Hershey’s Ready to Eat Pudding in the refrigerated section of Walmart near the yogurt products. We used the Chocolate flavor for our cute bat snack, but they also have a delicious S’mores flavor that your kids will love. While you are at Walmart make sure to grab the September/October issue of ALL YOU Magazine and you’ll find a $0.55 off coupon for Hershey’s Ready to Eat Pudding inside. 1.Gather your supplies. Trace the top of your Hershey’s Ready to Eat Chocolate Pudding onto your black cardstock paper and then cut out the circle. 2. Cut your black circle in half and then make a fold at the bottom of the half circles. 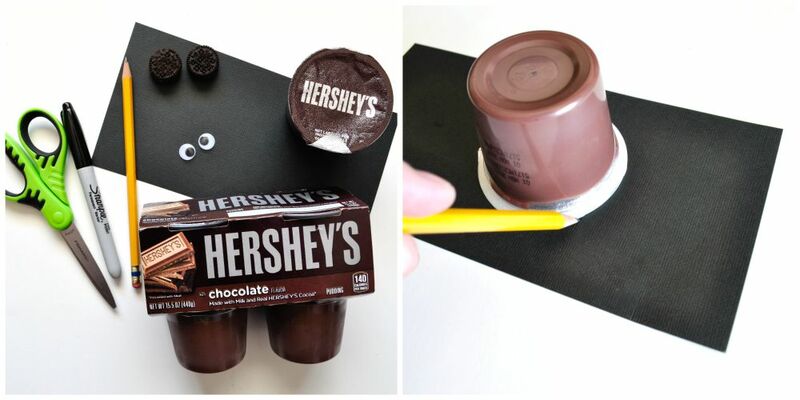 Use glue dots to attach the half circles as wings onto the side of your Hershey’s Ready to Eat Chocolate Pudding. 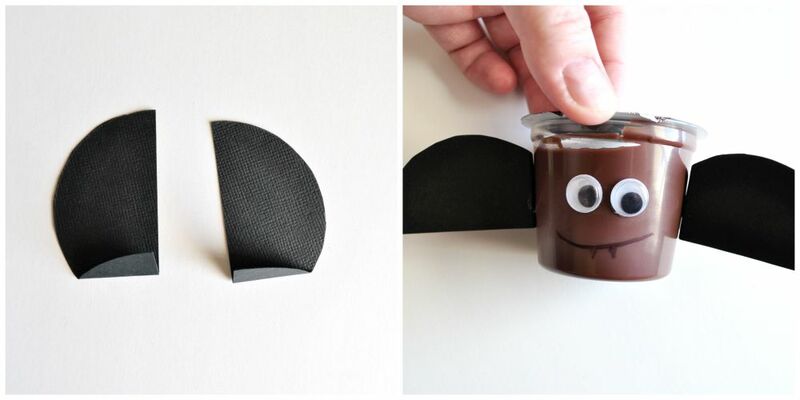 Also glue your googly eyes onto the front of your pudding cup. 3. Draw a smile and teeth on your bat with your black permanent marker. 4. Use a knife to trim two mini sandwich cookies into a triangle shape. 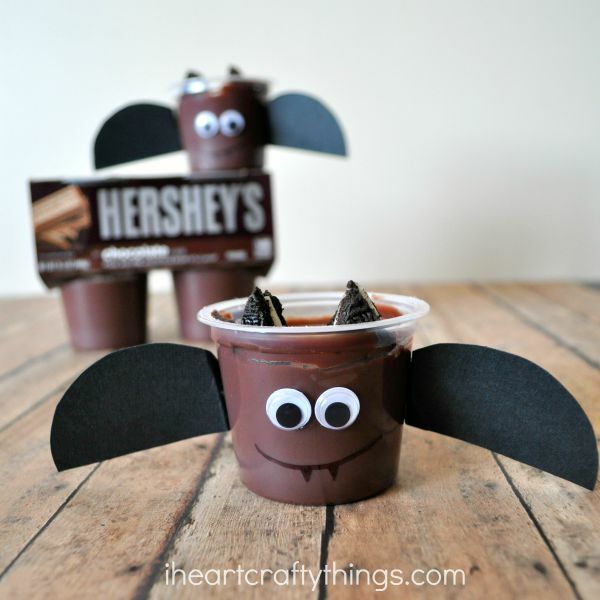 Right before serving your Hershey’s Chocolate Pudding Snack remove the top cover of the pudding and press the two sandwich cookies into the pudding for bat ears. 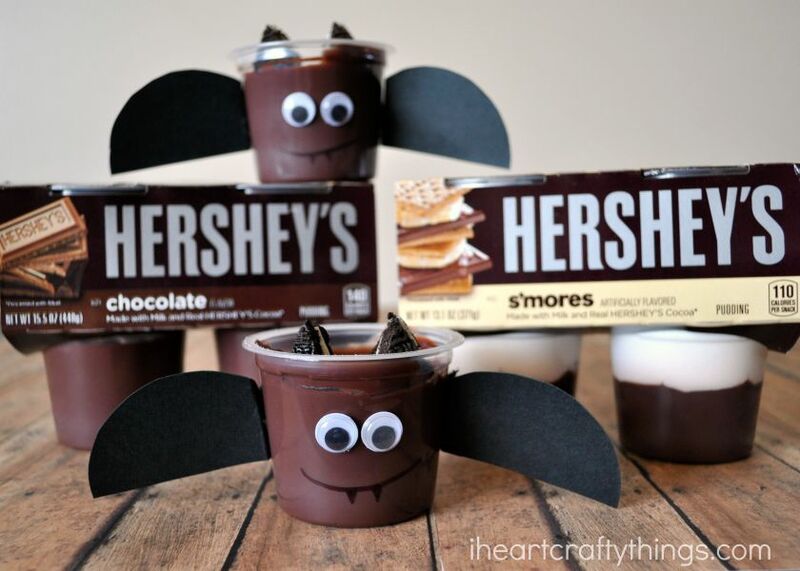 If you want to surprise the kids with this fun snack in their lunchbox at school, simply add the triangle-cut sandwich cookies in their lunchbox for them to add themselves, or omit the sandwich cookies and glue black cardstock ears onto the top of the Hershey’s Ready to Eat Pudding container instead. Not only does this make a fun after school snack, but it’s simple enough that kids can create it themselves. So have fun as a family making them on a Saturday morning and then take them to the park as part of a picnic lunch. 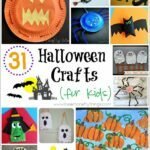 Kids might also enjoy making them for their friends as a special Halloween treat or include it as a kids activity at a Halloween Party. 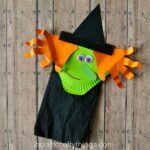 Be sure to check out more fun snack ideas and crafts at Kraft.com or follow Kraft Foods on Facebook and Twitter for more snack inspiration. How do you make snack time fun at your house?